There are many things that you probably did not know about chocolate, particularly chocolate during the Easter or Lenten season. The first thing is that Jews may have created the chocolate Easter eggs. In the 17th Century in southwest France, these chocolate Easter eggs were passed around during Mass. Easter eggs are supposed to be a reminder of the resurrection of Jesus. People did not eat eggs during Lent, so therefore, saved them up to enjoy on Easter. Egg-shaped chocolates came out of this tradition. Secondly, Quakers made Easter eggs at one time. They owned the Cadbury and Fry’s chocolate companies who argued about which one created the first Easter egg in the United Kingdom. 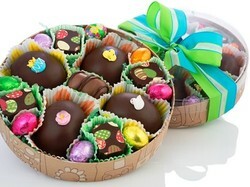 The first chocolate Easter egg in the United Kingdom was created in 1873. Quakers usually do not observe Easter but found a business opportunity and took it. Third, there were arguments on whether you could drink chocolate over the Lenten season or not. People said that they should be able to drink it because it quenches your thirst, and also Christians drank wine during fasts, so drinking chocolate should be allowed, too. In 1666 the Holy Office of the Pope made the decision that you could drink chocolate on a limited basis; you could only drink it when it was made with just water. In France, fish-shaped chocolates were made before Easter, probably to symbolize Jesus and His miracles with fish. Another possibility is that the chocolate may symbolize that fish instead of meat is eaten during Lent. We do not really know the original reason for this. Barton’s, the 20th century Orthodox Jewish owned chocolate company, made Easter Eggs complying with the Jewish food laws, and the eggs were made with certified kosher. The Madelaine Chocolate Company still follows these laws for their chocolate eggs. Treat your group to a spiritually memorable experience by visiting one of these Orthodox churches in St. Petersburg, Russia.